14.11.2012 (Hvino News). Tbilisi publishing house Exclusive Print Plus released the English language edition of book “Georgian Ampelography”. The book written by Niko Ketskhoveli, Maksime Ramishvili and Dimitri Tabidze was first published by the Academy of Sciences in 1960. Editors of new edition D.Maghradze, L. Vashakidze and T.Ghlonti decided to complement the definitions of terms and toponyms with new descriptions reflecting the development of Georgian viticulture and oenology since the 1960-s to present day. Ampelography (from Greek ampelo meaning ‘vine’) is the field of botany concerned with the identification and classification of grapevines. In the previous version of "Georgian Ampelography" 57 vine varieties were studied. 52 are locally presented vines, with just five being wide-spread and well-known French varieties. The characterization of each variety is presented in detail on 450 pages of this colorfully illustrated book. 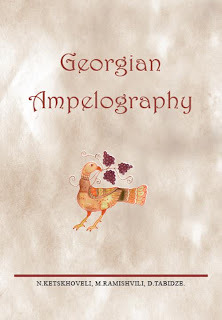 The book "Georgian Ampelography" is available for free download from National Parliamentary Library at this link. Is it possible to buy a printed copy of this book ? and where from ? Ok, Russia lets Georgian wine in, what’s next? Georgian wine in Russia again?